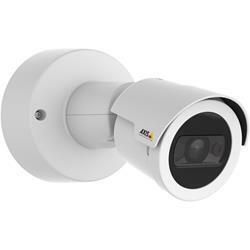 AXIS M2025-LE Network Camera is a small bullet-style camera that offers Axis excellence at a surprisingly affordable price. It has built-in IR illumination and HDTV 1080p video quality, and it's a perfect choice when you need small, easy-to-install cameras both outdoors and in. With its built-in IR LED and HDTV 1080p image quality, AXIS M2025-LE delivers high-resolution surveillance even in the dark. A single camera covers a wide 115° horizontal field of view, which helps keep costs low. WDR - Forensic Capture optimizes footage of backlit scenes for forensic purposes. And for monitoring long, narrow areas, Axis' Corridor Format provides a "portrait"-shaped video stream that maximizes image quality and eliminates bandwidth and storage waste. In addition, Axis' Zipstream technology also significantly reduces storage and bandwidth, while ensuring that important details are captured in full image quality. AXIS M2025-LE can withstand temperatures as low as -30 °C and as high as 50 °C (-22 ºF to 122 ºF). It comes with an integrated sunscreen for protection against sun and rain. And with IP66 and NEMA 4X ratings, it's resistant to rough weather, dust, sand and salt spray, ice formation and high water pressure. Small, lightweight and factory focused, AXIS M2025-LE is easy - and cost efficient - to install. A spacious, sealed back box, protects the cable and makes service fast and easy.